Description: What happens when, on a perfectly ordinary evening, all the things you believed in and took for granted are turned upside down? When her husband of more than 20 years is away on one of his business trips, Darcy Anderson looks for batteries in the garage. Her toe knocks up against a box under a worktable and she discovers the stranger inside her husband. It's a horrifying discovery, rendered with bristling intensity, and it definitively ends a good marriage. 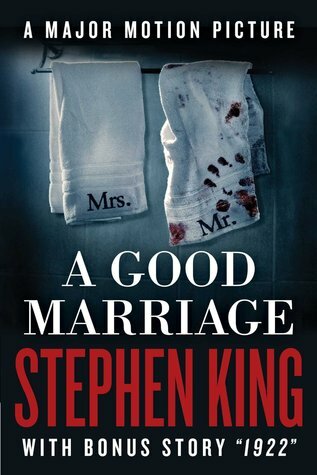 Why I Picked This Book: I've wanted to read Stephen King for years but the length of his books were a bit off putting. This novella seemed like the perfect thing and the blurb intrigued me too. My Impression: Well that was unexpected! I've always associated Stephen King with straight up movie horror. Lots of blood and screaming running people and a crazed serial killer chasing them. But this novella had none of that - well not really. Everything in this book was perfectly ordinary. The marriage was good but ordinary, the characters perfectly nice. Bob and Darcy are the kind of people you pass the time chatting with at a kid's birthday party and smile when you pass them at school open houses. That's what made what was lurking in the shadows so terrifying. Everyone knows that you can't really completely know what's going on in somewhat else's head but in a marriage - especially a good marriage - you can get pretty close. And King uses that instinctive knowledge as manipulation and as a weapon at times and it's so easy to identify with Darcy that it was uncomfortable at times to listen to it. This was terrifying in this most ordinary of ways which I think made the terror 100x more real. This wasn't aliens dropping from the sky looking to take out humanity this was an ordinary husband with an ordinary job and a horrific secret hiding in the shadows. It was eerie and unsettling and a completely compelling listen. Audio Note: Jessica Hecht does the narration for this novella and she's the perfect Darcy. Her voice has just enough inflection to catch and keep my attention and have me holding my breath at times but not so dramatic that I can't imagine her reading the minutes at a PTA meeting. Would I Read More of this Series/Author? I'm not sure. I really enjoyed this but it was so unsettling that it might take me a little while to get the courage up to read another! However, when I get the courage up I won't hesitate to pick up The Shining or one of the others I've been wanting to read for years. Would I Recommend this Book? If you've been wanting to read Stephen King for a long time but have always chickened out I think this is a great place to start. I kind of went off Stephen King's writing around the time he had the accident. I seemed to read a pile that I just didn't like as much as his early stuff. I do have a few that I was gifted that I guess I better get to at some point! I loved the movie! It reminds me of the early King books. This one disturbed me like Gerald's Game did. He has a way of unsettling me with stories like these and I can appreciate that in an author. I read a Stephen King short story as a teenager and hated it so much I didn't touch his work again until a couple of years ago. I do like what I have read in recent years. This sounds like something I would like. You've tempted me with your review but I'm not sure. I've never been a fan. I'll keep it in mind. That cover is creepy. I've read a couple of his books - he's a very talented author, no wonder you were unsettled!